Hi, this is Jennifer and I am so excited to be the creative guest today. I have this little blog, called A Happy Circus where I write about a mish mash of everything crafty and beautiful. From sewing to scrapbooking to cooking, if it’s light, airy, beautiful, ruffly, vintage or pink than I am happy. The circus part is trying to raise four children while doing all of the above. But I wouldn’t have it any other way. My life is definitely a happy circus. 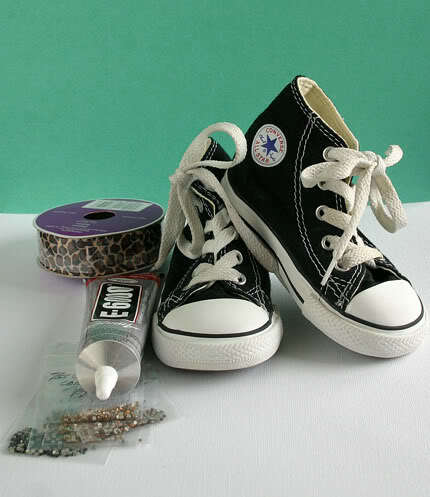 Grab your favorite pair of chuck taylors and let’s get started! swaravski flat back crystals size 7ss or 9ss (4-6 bags of 144 each) (I got mine on Ebay). First, come up with your design. You can sketch it onto the shoe with a pencil, or you can freehand it like me. Spread out the crystals you will need. Make sure the room is well ventilated since the glue has toxic fumes. 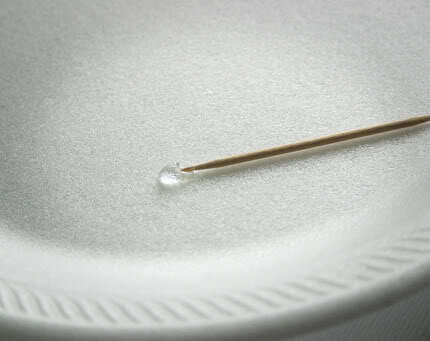 Squeeze some glue onto your plate. Then grab the crystal with your tweezers. 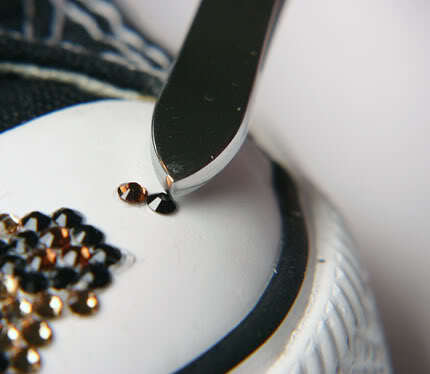 You will need to keep adding little pea size amounts of glue to the plate every two minutes as the glue starts to dry out. With your toothpick, you can apply the glue to the back of the crystal or you can dip the back of the crystal into the glue. 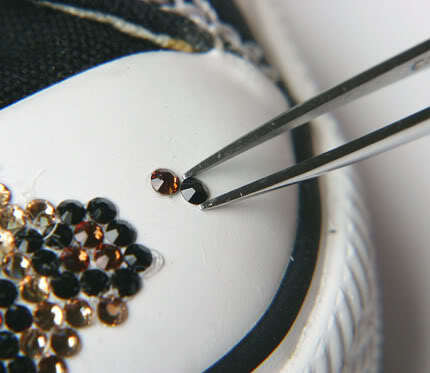 Place your crystal onto the shoe. Don’t worry about the glue strands. You can pull those off with tweezers when it dries. Pat the crystal into place with the back of tweezer or your finger. Repeat, repeat, repeat, repeat. If necessary take many breaks. The whole process takes a few hours. When finished let dry for 24 to 72 hours to “cure”. Then add your favorite ribbon and enjoy! Don’t have a princess in your life? You can bling cell phones, laptops… and anything else you can dream up. Just make sure it is not an area near the mouth, you don’t want a baby ingesting the chemicals. I want to make a pair for me!! These are sooooooo cute. I think this would make a great baby gift. Running to Wally World this afternoon. Thanks for sharing. That’s for such a stellar idea! I’m totally making these!!! What an awsome idea!I’m making one pair for me and one for every girl I know! I know aren’t these the cutest shoes ever?! The bling is fabulous and I think the ribbon is a darling addition!! I am so heading to Target to get my girlies some converse! This is adorable! Darling! 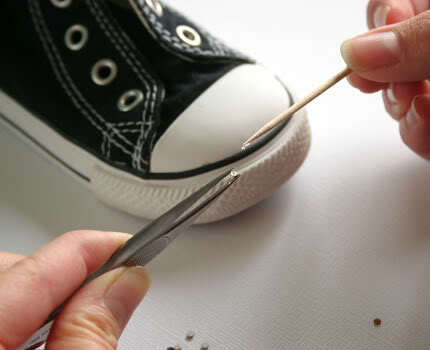 My daughter just outgrew her chucks, I’m off to ebay to get some prices on some bling for a new pair. SUCH a great idea. I’m so doing this to my cons! So stinkin’ cute! I absolutely love it! Where can I find a good deal on some converse sneakers? I’m glad you all love the tutorial. Linds- you can get some awesome deals on converse through ebay. You just have to keep looking. I’ve amassed quite the collection with $9 being the most I’ve paid for a pair (brand new). I love this idea. I think I have to try this. Love these! Just a quick question: how did you finish the ends of the ribbon shoelaces? I L-O-V-E them…I want to make these for my daughter and me..
a child & an adult size sneaker?? you recommend for a child & adult size shoe?